SensorScope What you can’t see can affect your pictures. Dirt comes from many sources and it must be removed in a safe and effective way, or your images will show this debris. Four common types of contaminants can get on your image sensor: Metallic, Fiber, Organic and Silica/Quartz particles. Only the SensorScope system addresses all four types of material and the proper way to remove them safely. What you can't see can affect your pictures. Countless types of contaminants will turn up in the camera chamber and on the sensor. Dry loose particles may statically adhere, while wet particles can chemically bond to the sensor. Contaminants come from changing lenses, dusty/humid environments, and even from inside the camera chamber itself. SensorScope enables you to check your sensor to see if it needs cleaning-there's nothing safer than not cleaning your sensor. 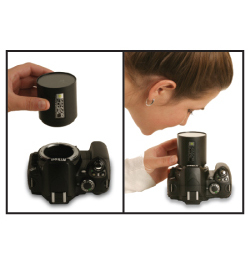 The SensorScope looks like a camera lens; however, it allows you to look back into your camera to inspect your sensor. The SensorScope is easily portable and provides a 5x magnification lens and 4 ultra bright LED lights, which are focused to completely illuminate the field of inspection. Although specifically designed for Canon and Nikon DSLRs, the SensorScope may be used on any manufacturer's DSLR. The SensorScope has 5X magnification with ultra bright LED illumination for precise sensor inspection. Fully charge your camera battery & set it to cleaning mode. Place the SensorScope onto your lens mount, and press the power button to illuminate the sensor.